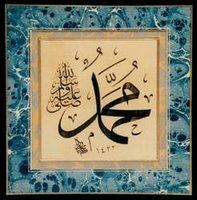 Many of you know that even though Prophet Muhammad came about 570 years after Jesus, but there is no picture, portrait or statue found of Prophet. This is because he strongly encouraged the faithful follower not to fall into the same mistake as Christians fell into by making statues and images, finally worshiping Jesus Christ instead of One God (violating the Commandments of God). Many non-muslims find it fascinating and strange. (infact any Art historian can tell that the image of Jesus Christ is not his actual one, but copied many years later from the potrait of Apollo, the mythical sun god of Roman local religion. That's why in most depiction Christ look like an european white man with blue eyes and blonde hair whereas in reality he was semitic in race, the same race that Arabs are in root and obviously with black flowing hair. Thus none of his idolized or pictorial depiction are true and authentic at all). His gait was firm and he walked so fast that others found it difficult to keep pace with him. His face was genial but at times, when he was deep in thought, there there were long periods of silence, yet he always kept himself busy with something. He did not speak unnecessarily and what he said was always to the point and without any padding. At times he would make his meaning clear by slowly repeating what he had said. His laugh was mostly a smile. He kept his feelings under firm control - when annoyed, he would turn aside or keep silent, when pleased he would lower his eyes (Shamail Tirmizi). He was always the first to greet another and would not withdraw his hand from a handshake till the other man withdrew his. If one wanted to say something in his ears, he would not turn away till one had finished (Abu Dawud, Tirmizi). Those who have seen him, in describing him they always described him as someone in appearance whom they never saw before, and never saw even after his death. He was especially fond of children and used to get into the spirit of childish games in their company. He would have fun with the children who had come back from Abyssinia and tried to speak in Abyssinian with them. It was his practice to give lifts on his camel to children when he returned from journeys (Bukhari, Sahih Bukhari, Vol. 2 pg.886). He would pick up children in his arms, play with them, and kiss them. Technology of the Heart: How did Prophet Muhammad look?